TSH, or Thyroid Stimulating Hormone, is a hormone released by the pituitary gland in the brain. This hormone signals the thyroid gland, located in the front of the neck, to release two hormones, T3 and T4. Thyroid hormones help the body metabolize energy. They are also essential for normal brain development in newborns and children up to age 3, according to the article "Hypothyroidism" written by Thomas P. Foley, Jr., M.D., professor of pediatrics at the University of Pittsburgh School of Medicine. In children, a TSH level of 5 Milli-international units per liter (mIU/L) or greater is considered elevated. Patients with TSH levels of 4.0 mIU/L or higher are considered to have hypothyroidism. An elevated TSH level means the thyroid gland is not producing enough hormones to support the body’s needs. Children with elevated TSH levels exhibit symptoms including a large thyroid gland, slow growth and short stature, muscle weakness, infrequent and hard stools, dry skin with yellow coloration and early sexual development according to Foley's article. A physician will diagnose elevated TSH levels by testing the child’s blood. The serum TSH is the most sensitive test for detecting mild thyroid hormone excess, according to the American Association of Clinical Endocrinologists (AACE). The association also recommends tests including the Free T4 estimate, testing for thyroid autoantibodies and a thyroid scan or ultrasonography to evaluate suspicious structural thyroid abnormalities when diagnosing hypothyroidism. The AACE considers the optimal goal for TSH levels to range between 0.3 to 3.0 mIU/L. It is important to catch elevated TSH levels in children early. Insufficient thyroid hormone in children will prevent the brain from developing properly and can stunt a child’s growth according to the article, “Hypothyroidism in Infants and Children” by Mary Shomon. To help return a child’s elevated TSH levels to a safe level, the standard treatment is a prescription drug called levothyroxine replacement. It is a synthetic hormone replacement. The dosage of the drug will be tailored to meet the child’s needs. In most cases, the child will react well to the drug and will continue taking it throughout his life. The drug is most effective when taken on an empty stomach or before an infant feeding. The AACE recommends adequate follow-up examinations and monitoring of TSH levels as dosages of the prescription drug will need to be adjusted as the child grows and enters adolescence. Children over age 3 with a history of hypothyroidism should have their TSH levels tested annually. 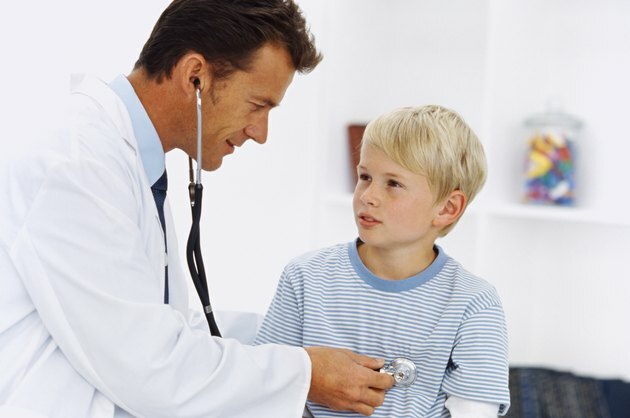 The AACE recommends patients under age 18 follow up with an endocrinologist.